Painter Byron Birdsall is an artist with a national reputation for his depictions of nature, and a guy with a hankering for some auld lang syne. Best known for the variety and drama of his Alaskan landscapes, Birdsall’s unique ability to capture light is evident in all of his paintings, along with his penchant for times gone by, including his nostalgic renderings of Whidbey Island. 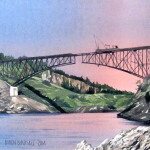 Rob Schouten Gallery presents “Island Times… Greenbank and Beyond” featuring the paintings of Byron Birdsall. The show opens Friday, Aug. 29 and runs through Monday, Sept. 29. 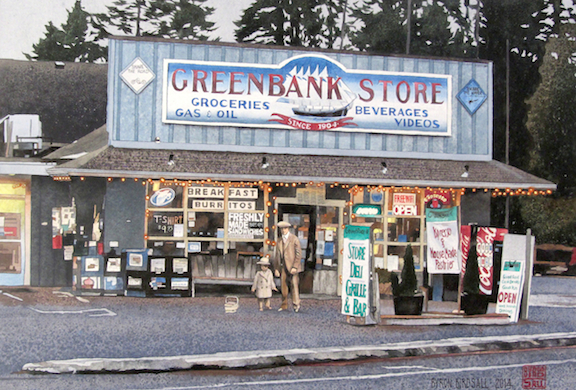 While landscapes and cityscapes are Birdsall’s forte, his love of history has led to painting from archival material resulting in many historical pieces, such as his early 20th century depictions of the Greenbank Store, and downtown Langley and Coupeville. The show will also feature the artist’s iconic landscapes of his beloved Alaska and of the Northwest. A longtime resident of Anchorage, Alaska, and now living part-time on Whidbey Island, Birdsall found more inspiration in the Puget Sound region, particularly Mt. Rainier, the Olympic Mountains and the island. 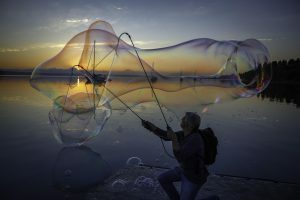 “I first came to Whidbey Island in 1999 and was entranced by the beauty of the place, and Whidbey Island has a rich and interesting history, as well,” Birdsall said. Using old photographs, Birdsall captures scenes of Whidbey that reveal his pleasure in the charm of small town life. In fact, Birdsall said his long career as a painter has all been a great pleasure, occupied as he is by doing the thing he loves best. Please join us for light refreshments and a chance to meet the artist from 1 to 4 p.m. Sunday, Sept.14 during Greenbank Farm’s “Second Sunday at the Farm” event, when the Farm’s galleries, shops, cafe and market welcome visitors to enjoy a relaxed afternoon of fine art, good food, natural beauty and lively conversation. Rob Schouten Gallery, a premier showcase for Whidbey Island and Northwest artists, is located at 765 Wonn Road, #C-103 at the historic Greenbank Farm. Gallery Hours are 10 a.m. to 5 p.m. daily. For further information, call 360.222.3070 or email info@robschoutengallery.com.